New! Honeywell 8670 Wireless Ring Scanner | Taylor Data Systems, Inc.
Honeywell recently announced the release of the 8670 Wireless Ring Scanner with Bluetooth® technology, a compact, lightweight scanner that fits comfortably on a finger to allow workers to keep both hands free when completing tasks. For warehouse and retail applications where workers can be more productive with both hands free, the 8670 is an ideal choice with excellent scanning performance and a rugged two-piece design. Lightweight and comfortable, the 8670 is also easy to clean. This small but powerful device makes picking, packing and shipping operations easy to carry out without slowing down the user or getting in the way. And the 8670 is also a great choice outside the four walls for field service, transportation and logistics applications. 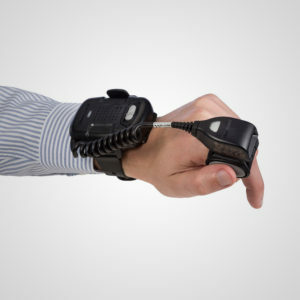 Easily paired with other Bluetooth-ready, Honeywell devices like the Dolphin™ 70e Mobile Computer or the Thor VM2 Vehicle Mount Computer, the 8670 allows users to handle packages and operate warehouse vehicles without having to put down or pick up the scanning device each time they need to switch tasks. If you’re already familiar with Honeywell scanning technology, you’ll know why they are the leader. The 8670 scan engine is based on the Xenon and Granit scan technology, which offers fast, accurate scanning that keeps employees moving without the worry of barcode label quality. Looking for ways to improve worker productivity? We can help you put together a strategy that will optimize your processes, improve throughput and control costs without exceeding your budget. Consider a site assessment to determine your basic requirements, or tell us about your most pressing operational challenge. Contact us today to schedule an appointment.